The Ronacher Theatre was once called "Etablissement Ronacher" and is a popular theatre in the first district of Vienna. It is part of the "Vereinigte Bühnen Wien", a network of theatre stages operated by the city of Vienna. 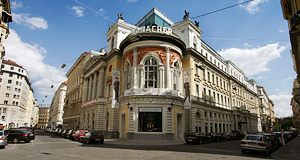 The Ronacher was founded as the "Wiener Stadttheater" and a private enterprise of the journalist Max Friedländer and the playwright and theatre mamnager Heinrich Laube. The original objective of the two was to build a theatre for a non-noble audience that was ot affected by social and political censorship and that worked in direct competition to the Imperial Burgtheater and other stages of the "official" Austria. The Wiener Stadttheater was opened in 1872. Twelve years later, in 1884, the building burnt down completely. The ruins were purchased by a gentleman called Anton Ronacher in 1886. Initially, he had planned to re-build it as a proper theatre - however, the legal fire regulations had been changed by then. Since the theatre was not freely accessible from all directions, the Ronacher did not get a licence for normal theatre productions. Therefore, the Ronacher - after being re-built in historicist style in 1888 - was re-opened as a concert- and ball venue. It was associated with a hotel and got not only electric light, but also a ball room, a conservatory and "promandes" where visitors could amble. The fact that the Ronacher was no longer a theatre also meant that there were no fixed rows of seats. Rather, there were tables and normal chairs. During performances, people were allowed to eat, drink and smoke - the Ronacher had become a Variete theatre. Anton Ronacher himself had to sell the building a few years later due to financial difficulties. After 1890, the reputation of the Ronacher became increasingly bad - the program included performances of acrobats and circus-like attractions. Vienna′s aristocracy left the Ronacher and the space was taken over by the common people from the Vorstädte ("suburbs", today′s districts two to nine). The Ronacher in turn developed expertise in the production of operetta, variete and other kinds of rather shallow performances. This changed briefly after WWII; the Burgtheater had been damaged by bomb raids and the ensemble of the "Burg" used a bunch of stages and smaller theatres as alternative venues. One of them was the Ronacher, which enjoyed proper theatre productions until the re-opening of the Burgtheater in 1955. In the years that followed, the Ronacher returned to the original variete and cabaret shows. From 1960, the Austrian National Broadcast ORF started to use the Ronacher as a studio for TV productions. This ended essentially in 1976, and the Ronacher was not in use for approximately ten years until 1986. That year, the Ronacher′s regular business was started again, with operettas being produced. In 1987, the Vereinigten Bühnen (the stage association mentioned above, which still runs the Ronacher today), purchased the venue and transformed it into a musical theatre. In addition to musical productions, the Ronacher serves as a festival venue and is often used for award ceremonies, conferences and alike. Throughout the 1990ies, the Ronacher was in the news for its plans to add a third floor. There were modern designs that would have made the distasteful piece of historicist ugliness somewhat attractive, but since the Viennese are for some reason really proud of their historicist crap, there was a lot of resistance against these plans. In a somewhat downgraded variation, they were finally done in 2007 and as of 2008, the Ronacher is a modern musical stage in the heart of Vienna. Attractions nearby include the Stadtpark, the Museum of Applied Art, the Postsparkasse and the former Ministry of War.